Is seven your lucky number? 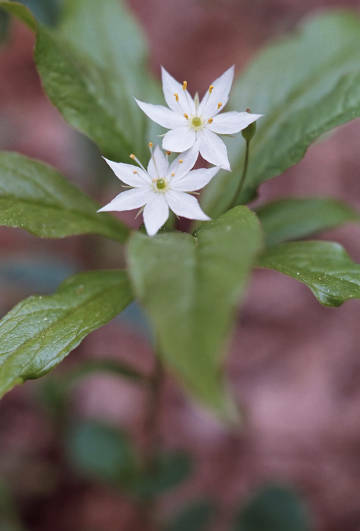 If so, you might especially enjoy looking for starflower in Westborough’s woods in mid-May, between Mother’s Day and Memorial Day. Starflower (Trientalis borealis) is unusual because it has flowers with seven petals, although it’s possible for the flowers to have 5 to 9 petals. This lovely native spring wildflower was featured as the flower for the number seven in a counting book for young children, I Can Count the Petals of a Flower by John and Stacey Wahl (1976). The authors enjoyed telling of their long search for a flower with seven petals and their joy when they finally found a starflower to photograph to illustrate “7” in their book. Starflowers grow in the woods in places such as Westborough’s Bowman Conservation Area and Headwaters Conservation Area. These areas are very typical of the woods in town, so who knows, you might discover starflowers in the woods near your house. Look for low plants, only 3-9 inches tall. Each plant has a whorl of 5-10 long, pointed green leaves and typically has two star-shaped white blossoms, about half an inch wide, each on its own delicate stem growing from the center of the whorl. Along with seven petals, the flowers also have seven stamens with pollen-bearing anthers, one for each petal. If the weather does not get too warm, starflowers can remain in bloom for a couple of weeks. Native bees pollinate starflowers, so these plants do not depend on honeybees, which are not native and have suffered diseases and unexplained problems in recent years. Like many other spring woodland wildflowers, starflower is a perennial that is able to bloom early in spring because it draws on nutrients that it has stored underground. Starflower has a rhizome, or underground stem, for this purpose. The plants stay green and store away nutrients until midsummer, when they produce small seed capsules and go dormant. At that time the plants shed their leaves. The seeds need to be exposed to cold weather and typically germinate in the fall of the next year. Starflowers are only one of the treasures you might find in the woods in May. This year’s late arrival of spring has compressed the spring wildflower season, so it’s possible that we’ll see more wildflowers blooming together than usual.